In a series of bizarre commercials, ExxonMobil appeals to parents and moms in particular to use their gasoline. 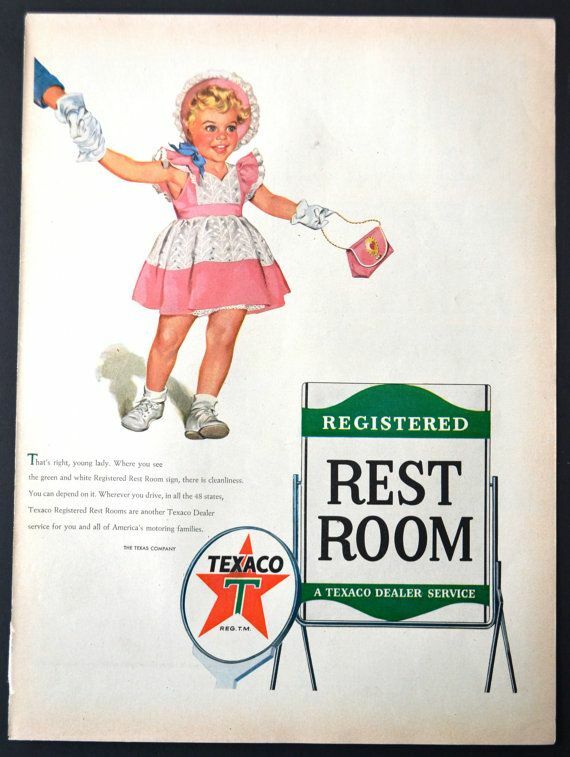 Gasoline companies also liked to sell women, as with the campaign to have certified nurses who worked at gas stations to verify that the stations were clean. 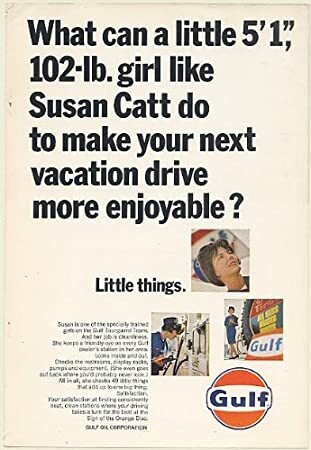 Check out my book for more ways that gasoline and oil companies marketed their products to women, as well as the appliances and promotional items they sold as well! I hope you’ll check out my new article about pioneering driver, Alice Ramsey. Summering in Asbury Park in 1908 enabled Alice Ramsey to hone her motor skills as she drove 6,000 miles of Monmouth County roads. She developed skills to care for and maintain the car, with few services available to her. Her winning performances in endurance runs on Long Island and between New York City and Philadelphia caught the eye of a Maxwell-Briscoe car promoter who invited her to undertake a sponsored trip across the country. When she crossed the country in 1909, only a tiny percentage of women drove; there were few formal roads and very little guidance on how to navigate. While she was known throughout her life as Mrs. John R. Ramsey and had two children, after her husband’s death in 1933, Alice Ramsey, under cover of her married name and her identity as mother, grandmother, and great grandmother, lived for 50 years with women she loved. Her wealth, presumptive heterosexuality, and notoriety as an automotive pioneer led newspapers and magazines in the 1960s and 1970s to cover her unconventional life. Delighted to report that my book, Women at the Wheel, was excerpted today on the blog at Hemmings.com. In the first day, 55 people commented on the excerpt and offered personal stories about women drivers in their lives, insights into how they saw women as drivers and their relationship with cars, and reflections on the article. So pleased to have inspired such an animated conversation and appreciative of the opportunity to hear so many people reflecting on women and cars. Hope you’d enjoy the excerpt and their comments, too! Sheriff Troy Nehls sought to charge the owners of the truck and when he was thwarted on rights of free speech, he targeted the owners by digging up an outstanding warrant against the woman, and arrested her. Advocates and international human rights groups criticized Saudi Arabia for their policy forbidding women to drive because it violated women’s basic rights. Their efforts to change the law were met with intense resistance starting in 1990. One Saudi woman recounted that “‘the mutawa (military fundamentalists) demanded that the women be beheaded,’” and their own relatives threatened them with death for the shame they brought upon their families. Stripped of their jobs and their travel papers, the government effectively detained the women, tapped their phones, and threatened their families. Over twenty years later, trying to lay claim to the freedoms promised by the “Arab Spring” that emerged in 2010 and building on the hope created in 2005 when the King of Saudi Arabia surmised that it would only be “a matter of time” before women drove, women in Saudi Arabia planned a 17 June 2011 protest. Their efforts, however, revealed no momentum for the movement, as only about 50 women reported driving with only minimal attention from the authorities. The international attention, however, continued to expose the Kingdom’s denial of human rights and they remain the only country in the world that did not allow women to drive. Until today, as the King of Saudi Arabia has now decreed women can be at the wheel. Bruce Springsteen frequently refers to women as “girls” in his music and while he found freedom and mobility behind the wheel, he generally imagined women in the passenger seat (or the back seat). Delighted to announce that Women at the Wheel is now available at the University of Pennsylvania Press site (use PH89 for 20% discount) and Amazon — here I am with the first copy off the presses! Katherine Parkin is Professor of History at Monmouth University in New Jersey. She has written extensively on US Women’s, Social, and Cultural History. To learn more about Katherine, click here. Women at the Wheel is available for pre-order on Amazon, the University of Pennsylvania Press Website and the Barnes and Noble Website.